By 1813, Napoleon could count on more than a million soldiers in his Grande Armée, which was made up of not only French units, but also foreign ones too, including Polish, Dutch, Italian and Spanish regiments. The Napoleonic army was made up of three combat arms: the artillery, the infantry and the cavalry. Alongside the troops were also an engineering corps and a health service. Artillery is the art of cannon-warfare. The infantry was made up of grenadiers, riflemen, cuirassiers and skirmishers, who fought on foot and used rifles. The cavalry was made up of dragoons, cuirassiers, carabiniers, lancers, chasseurs and hussards, who were all mounted on horseback and fought with lances, sabres or swords as well as pistols. The engineering division were men who were given the job of building bridges to allow the troops to cross rivers, as well as installing fortifications to protect the army’s position or besiege a town. The health service was comprised of surgeons and doctors who looked after the injured or sick members of the army. The soldiers were recruited through conscription: every young man between the ages of 20 and 25 was eligible to be called up, and the process was done through the drawing of lots. The men had to be in good health and without disability. The regiments were made up of young raw recruits and older veteran soldiers who had participated in many military campaigns. Very quickly, the new recruits learned how to march in step, to obey orders, to use their weapon and to look after their equipment. Promotion was usually based on the amount of experience that a soldier had, but an exceptional act of bravery or military deed could also lead to rapid advancement through the ranks. The Garde impériale was an elite unit that was made up of the best soldiers from the army. They were charged with Napoleon’s personal protection, both on the battlefield and on the road. To be in the Garde impériale, a soldier had to be at least 5’8″ (1.73m) tall and had to have served in another army corps for at least ten years. The ability to read and write was also required, which was not the case for other soldiers in the Napoleonic army. During the 19th century, England was a great economic and political power which was opposed to France’s expansionist policies. In 1803, Napoleon decided to organise his army at a large military camp in preparation for an invasion of England. It was quite a feat! 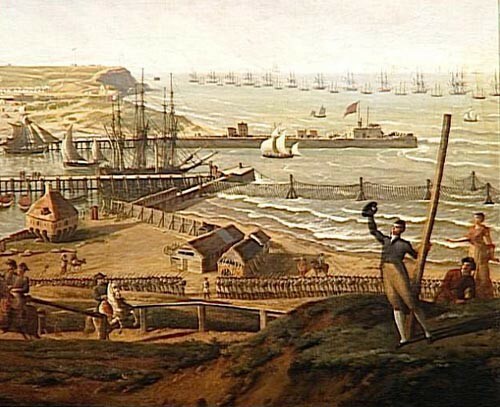 He chose the port of Boulogne, situated on the Channel, as the site for his military camp. Between 150,000 and 200,000 soldiers were housed in the camp, and the army that was based at this camp went on to form the core of the Grande Armée. Important engineering works were carried out at the camps, including the creation of docks, the building of barracks to house the army, and the laying of roads to facilitate camp traffic. The soldiers also received training in naval embarkment and disembarkment. On 16 August 1804, Napoleon was at the Boulogne camp to hand out a number of Légion d’honneur awards, a decoration that had recently been created. More than 100,000 men were present to watch the ceremony which lasted for more than seven hours. In August 1805, Napoleon abandoned his project for the invasion of England. Instead, he turned back towards continental Europe, as Austria was allying with Russia and preparing for war. But Napoleon was all-set for war himself and already had a ready-made and highly-trained army from his Boulogne camp. Until 1802, soldiers who displayed particular bravery were awarded an ‘arme d’honneur’: this could be a sabre, a rifle, or even a baton for drummers. The weapon was decorated with silver and engraved with the name of the soldier who received the honour and a description of the deed for which the weapon was awarded. Then in 1802, Napoleon created the Légion d’honneur, a star of five double-prongs with Napoleon’s image in profile at the centre. The star was initially awarded to soldiers who had displayed particular acts of bravery, before later becoming an award that was open to civilians as well.